I remember that in a episode of Mario World cartoons,Yoshi was afraid of enter in a haunted mansion,just like Scooby Doo.And what can say about Luigi and Shaggy......at least for me they have very similar personalities,but the important point is that they both are very very cowards. Great work. 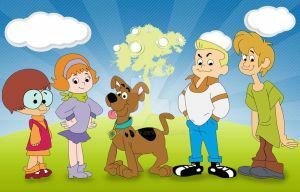 I alway loved Scooby Doo as a kid. You forgot the glasses for Daisy as Velma. All their faces were not modified to be like the orginal characters because that would look weird. I agree,Shaggy is a lot like Luigi. Very nice job btw. Good one princeas-daisy! You are the best! Oh, you don't have to do it. Really cool i would watch this show. I too, it would be too much epic! OMGGG I HAVE BEEN LOOKING FOR THE ARTIST AND PICTURE FOR YEARS I FINALY FOUND IT THANK GOD YOU ARE MY REALLY BIG INSPIRATION!!!! My childhood cartoon + My fave Nintendo game = THIS.